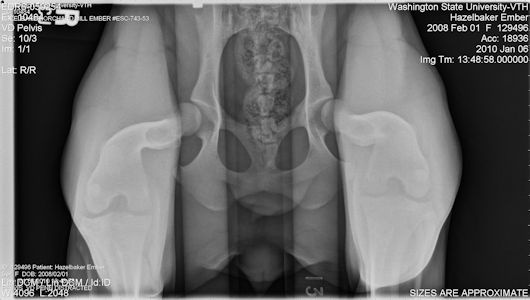 At some point, I plan to have her hips x-rayed again, just to see how a few years of wear and tear have changed them. Ember keeps herself very fit, and she is slim and trim - no excess weight. 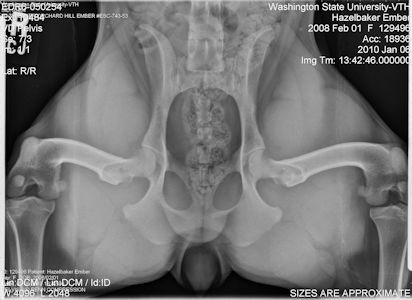 Excess weight and lack of exercise are two factors that increase the risk of developing hip dysplasia. PennHIP distraction view of Ember's hips. You can see that her right hip (left side of the x-ray) is not as tight in the socket as her left hip. This is the view that PennHIP uses to measure the distraction index on hips. PennHIP extended view of Ember's hips. This is the view used by OFA. I did not have an OFA evaluation of her hips done. She was not quite two years old when I had the x-rays done, and OFA requires that they be a full 24 months old for an official reading. This is the view that the vets can see the minor changes in her right hip. I had to ask them to show me, because I could never find them. There is a very slight thickening of the head of the ball, and a small line on the neck of the femur. PennHIP compression view of Ember's hips. This view shows how well the ball and socket really fit together. Ember's are a reasonable fit. That, and her high level of fitness, probably explain why, at five years old, she shows no signs of hip problems. 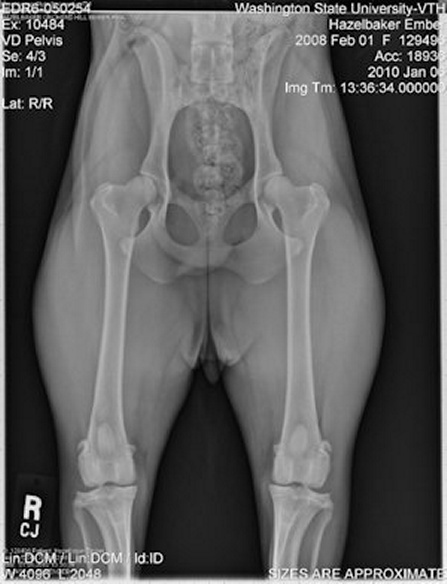 With a DI of .74 on that side, she is almost sure to develop some kind of hip dysplasia (arthritis) as she ages.